Comet image courtesy of Marie Vasquez, Helex 3 Inc.
Comet assay? Not a technique in astronomy whereby the solar system and beyond is scanned to assess the risk of the human race following the fate of the dinosaurs! The Comet Assay, also known as "Single Cell Gel (SCG) electrophoresis", is a highly sensitive and efficient means of assessing and quantifying DNA damage and repair at the level of the individual cell, applicable to any eukaryotic cell. Types of DNA damage include single-/double-strand breaks, DNA-drug crosslinking, DNA-protein or DNA-DNA crosslinking and oxidative DNA base damage.The technique is based on fluorescence microscopy and involves embedding nuclei in agarose gel, then electrophoretic separation across an applied electric field. The DNA is stained with a fluorescent dye, and subsequently imaged under an epifluorescence microscope. The resulting structure is reminiscent of a comet, consisting of the nucleus head, and tail of damaged DNA. During electrophoresis, fractured DNA fragments migrate away from the nucleus and the extent of DNA damage can be quantified by measuring the relative % DNA between head and tail. Importantly, the exact class of DNA damage can be examined by careful control over cell preparation conditions. For example, the extent of alkali treatment (pH control) that is used to convert a DNA damage site into a DNA fragment (essential for Comet detection) can discriminate between different types of strand breaks. Sites of DNA base modifications can be converted to DNA fragments by introduction of enzymes that act specifically on such lesions. Furthermore, DNA crosslinking and binding can also be detected by the Comet assay, by determining the extent to which these interactions retard migration of DNA. Since its "impact", Comet has become a core technique within fields or study such as toxicology, apoptosis, DNA repair, aging, cell cycle analysis and free radical biology. 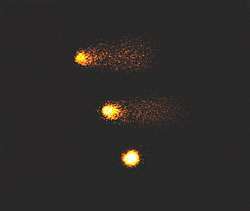 Comet slides are examined under a fluorescent microscope, often by widefield epifluorescence microscopy. Widefield epifluorescence microscopy has developed into a universally accessible technique for study of fluorescently labelled cells and tissues. Over the last few decades, this drive has been accelerated by improvements in fluorescent probes, labelling chemistry, optical instrumentation (such as filters and objectives) and detector technology. The widefield technique involves flood-illumination of the field of view by a wavelength or small wavelength range (often though use of an excitation filter and arc lamp). The stoke-shifted fluorescent emission transmits though the dichroic, that was initially used to reflect the shorter wavelength excitation light onto the sample, gets optically filtered once again by an emission filter (often called barrier filter), and focused onto the camera detector.